Watch the video. President Obama wasn’t crying during his announced executive actions on gun control – he was faking. Obama then stares directly into the lens – right into the eyes of the American people – as the cameraman hones in slowly for a tight, cropped shot of his face. “And from every family who never imagined their loved one would be taken from their lives by a bullet from a gun,” he continues, pausing once again. transfixed at this sudden show of emotion. Is Obama crying? Is he shedding tears? Stop video. Rewind. And look. Obama doesn’t just flick his finger at his eye. He wipes downward, across the lid, and then runs his finger along the whole bottom rim, following the line of the lashes. Then he blinks eight or so times. A teary-eyed President Obama talks gun control. But here’s the part to notice at this point: His eye is dry. Completely devoid of tears; completely lacking dampness. Yet Obama’s supposedly wiping away tears. Obma then pauses, lowers his head, and with hand cupped, thumb and forefinger bent, partially covers his mouth, once, twice – classic tells of lies – then shakes his finger for emphasis and speaks again. “Every time I think about those kids it gets me mad,” he says, reaching up and wiping the corner of his other eye, the right one, with a quick motion. Finally, a tear drops out of that right eye and slides down his cheek. He turns his head slightly and viola, at last, his left eye is now wet all around. Mission accomplished. Camera’s got the shot. Time to move on to policy. Almost as fast as the tears came, they disappear, and Obama’s next words – after a mention of violence in Chicago -- are scolds for those in Congress and on the streets of America to support his agenda. He wraps with another wipe to the dry skin beneath his right eye. Curtain fall. Exit, stage right. Bow and applause. So how’d he do it – how’d Obama manage the tearful performance? The article “How to Cry – An Actor’s Guide to Crying and Tears” sheds some light, explaining some of the methods the professionals use to drop teardrops on demand, within 60 seconds or so. The first suggested method, tapping into “memory driven tears,” requires the actor to be “very in touch with his or her past” in order to select a prior experience that guarantees the waterworks. The second asks the actor to tap into personal fears, and dredge up tears that way. “Both of [these] techniques … take a lot of imagination, emotional awareness and most of all, diligent practice,” the article states. I think we can rule out those methods for Obama. Next recommendation: “Be in the moment,” the article suggests. Given all the pauses for special effect, head dropping reflection and eye-blinking drama Obama underwent, no doubt he was feeling the moment – but was in the moment enough? 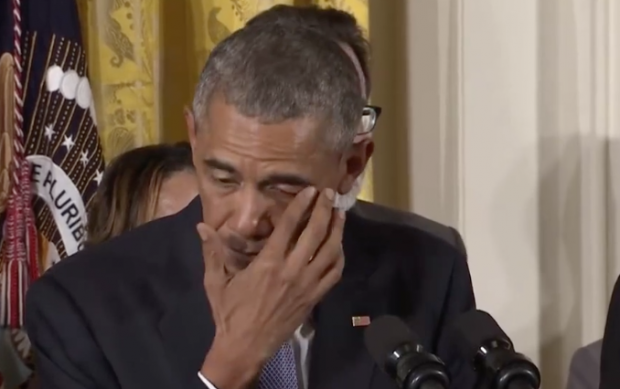 Given the American public has not seen Obama cry before – not after the Newtown shootings, or the Columbine murders, or the other gun-related acts of violence that he says makes him feel so despondent – it’s probably a safe bet Obama wasn’t feeling it as much as he humanly could. Not enough to drop real tears on demand, anyway. After all, he didn’t earn the label as a cold and detached leader for nothing. And he was making a pressure-filled nationally televised appeal to take unprecedented action for something he held dear to his legacy. So this brings up the tricks of the Hollywood trade. “Although some movie stars utilize some of the techniques mentioned above, many actors opt for an easier solution: menthol,” the article concluded. And that’s where my money rests – on a dab of Vicks vapor rub or similar menthol-laced product slid along the lid and bottom of an eye. The pungent fumes, combined with Obama’s practiced “Be in the Moment” rhetoric and reflections, jumpstarted the tear in his right eye; the tears from his left, fueled by the actual sting of the menthol, then fell fast and unfettered. Like I said, watch the video. Pause. Rewind and play again.